Every curve and contour of your ear is reproduced onto your Insta-Mold® Custom Molded Ear Plug, assuring superior protection from water and damaging noise. Insta-Mold Custom Molded Ear Plugs are comfortable enough to wear all day without fatigue or discomfort. Keeps water out of the ear & they float. The best protection for children who have tubes in there ears or anyone else who struggles with swimmers ear or recurring ear infections. 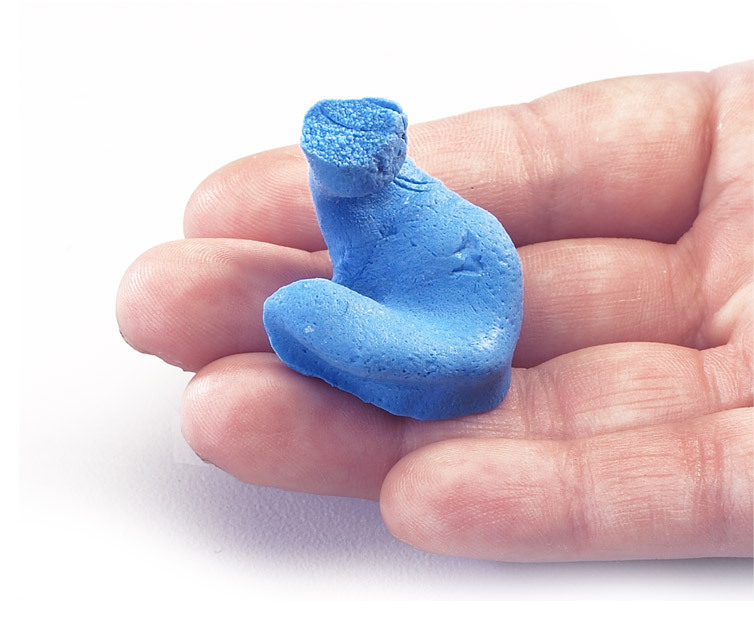 The above custom molded earplug was photographed minutes after it was taken out of the users ear. Before Anthony uses his new custom ear plug, we will trim off any excess pieces of rubber, and then coat the plug with our clear seal silicone coating. This will help keep his earplug clean, create a tighter fight, and create a more polished look. Insta-Mold Custom Molded Ear Plugs are designed to last for years of heavy use. * We recommend a new fitting after 5 years due to changes of the shape of the ear. Ten colors to choose from you can also have them swirled together. Insta-Mold Custom Molded Ear Plugs lock in your ear. Protecting your ears from damaging noise with the same consistent protection day after day year after year. You can further customize your Insta-Mold Custom Molded Ear Plug by converting them into a pair of custom molded headphones, a custom ear piece for behind the ear electronic hearing protectors, or you can have acoustic filters installed in one or both of your ear plugs.